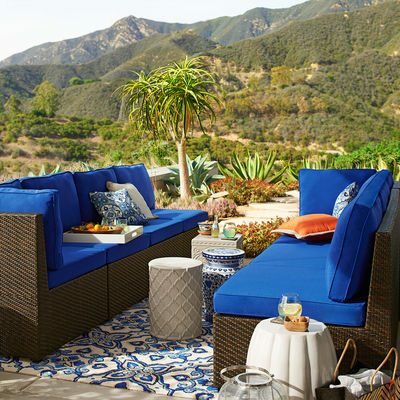 The dog days of summer are arriving shortly, but there are plenty of ways that you can keep your outdoor living areas looking cool and comfortable. 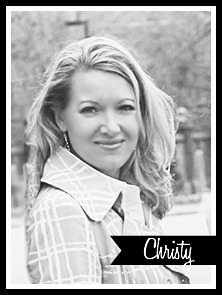 With so many choices available for lighting, rugs, curtains, and furniture, we can decorate our porches and patios as easily as we would any other room in our house. Conversation sets are so versatile! Take a book and a glass of wine outside and curl up for a few hours of relaxation, or join friends for an evening around the fire pit or on the dock. 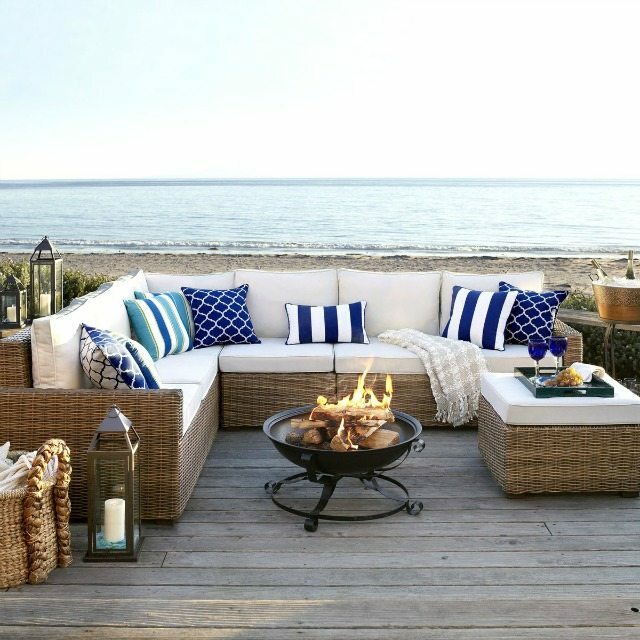 All-weather wicker is very durable, too (we’ve had our set for seven years and it’s still going strong). A sectional gives you plenty of seating for a crowd, too! Curtains can do several important things from a design perspective: they “finish” a room (whether indoors or out), provide privacy, and shield us from bugs, sun, and other elements. While you can certainly use indoor fabrics outside, they will fade quickly, making outdoor fabrics a much better long-term purchase. 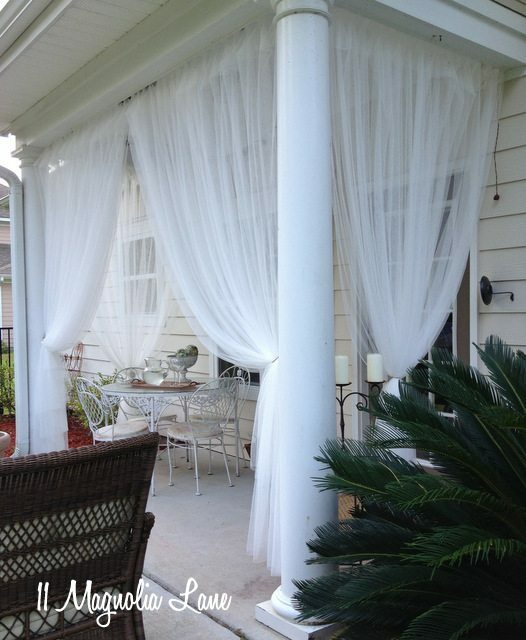 A budget option is to hang these sheer Lill curtains by IKEA around your covered porch. I’ve used them on several of my own porches and they are super–they’re inexpensive, wash beautifully, and keep bugs out. 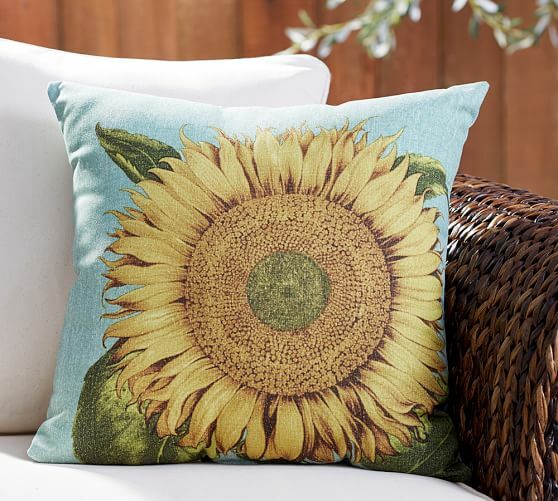 Just like when shopping for curtains, you’ll want to be sure that your pillows and rugs are made for outdoor use. That will ensure that they can get wet and will stand up to sunlight over several seasons of use. 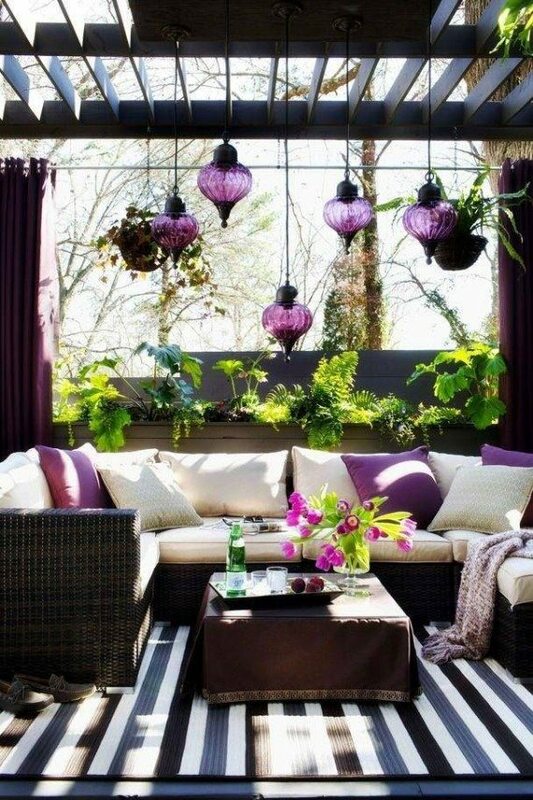 And just like inside your home, rugs and pillows finish a space outdoors, too. Don’t forget the lighting! Whether it’s strings of twinkle lights, an outdoor chandelier or “candle-lier”, or citronella candles burning in lanterns, your space won’t be complete without it. Now, can’t you just picture yourself relaxing in one of these beautiful spaces? I know I can!